Part of what makes the DD team so wonderful to be a member of is the family culture we have around here. Our players are all friends and have each other's back through thick and thin. Some players even seem to have their dynamic duo attached to their hip, as we've seen in some of our more recent videos. Today we thought we'd highlight some of the partnerships within the DD team and get a chance to know them a little bit more. 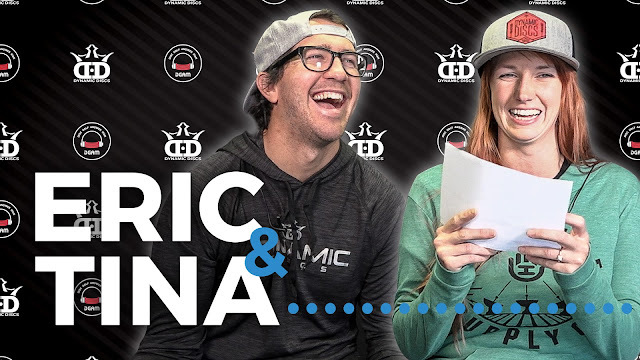 On a light-hearted note, we sat down with Eric Oakley and Tina Stanaitis and played a pretty fun game - how well do you know your teammate? From junk food to superpowers, they tested their skills and had a few good laughs. Click here to watch their full video and enjoy Tina's awesome laugh! Then, we had both Zoe Andyke and Dustin Keegan on Disc Golf Answer Man to learn more about their background and get into some of the nuts and bolts of their game. These two are so exceptionally talented at what they do and also work to spread the love of the game with kids in schools across the country. For a massive dose of disc golf inspiration, click here to watch their full video! Whether it's a fellow disc golfer, a best friend, or a soon-to-be spouse, who's your dynamic duo and who do you share your love of the game with?